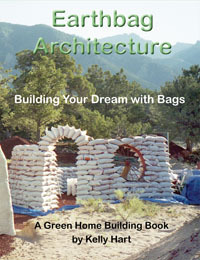 Much has been written on building with earthbags, but what is the most efficient building process? What are the most efficient shapes and design features? How can I optimize my time and resources to obtain the best possible home at the lowest cost? Although building details will vary from one project to the next, this article examines the most important factors in optimizing the construction process. First of all, let's look at the three most efficient building shapes: roundhouses, domes and organically shaped structures. Nature creates things with curves because they are the strongest, most efficient shapes. For a given amount of materials, you can obtain more livable space with these shapes than rectilinear designs. Curved designs are inherently stronger and thereby minimize need for buttresses that require time, labor and materials to build. Indigenous builders have been aware of these advantages for many thousands of years, but with the advent of factory produced materials this knowledge has started slipping away. Modern man-made building materials, in contrast, are harmful to the environment and not affordable to the masses. Organic shaped structures: Size and shape can vary widely, depending on cultural and household needs. Sometimes units are joined into large clusters. For sources of inspiration, refer to indigenous African dwellings and simple cob houses, as well as bird and insect nests, and animal dens. - Passive solar design uses free energy from the sun. Use it to heat your home, improve daylighting, heat your water, and dry and cook your food. - Utilize natural convection venting with air vents high and low in walls. - To reduce energy costs, build slightly below grade in dry climates where flooding is not a risk. In rainy and dry climates, earth-berming - banking earth against the building - will save energy and encourage water to flow away from the structure. - Insulated earth floors are simple, dirt-cheap and eminently practical. Add insulation and a moisture barrier under the floor, and seal the top surface with several coats of linseed oil thinned with turpentine. - Earth plaster is the lowest cost, most efficient way to protect earthbag walls. It does require wide roof overhangs of about 36 inches, however. Domes need to be protected with lime plaster or stabilized earth. - Build eyebrows (protective overhangs) over window and door openings on domes to prevent leaks and provide shade. - Small diameter roundwood gleaned sustainably from local forests is ideal for lofts, railings, furniture and other uses. - Built-in furniture such as earthbag benches can help reinforce the structure, enhance aesthetics and save money. - Rubble trench foundations are very low cost and simple. Fill a trench with gravel, rocks and/or broken concrete. Place gravel-filled bags directly on the rubble trench. - Insulated foundations reduce energy costs. You can 1) fill the rubble trench with scoria or pumice; 2) fill lower courses with insulating material such as perlite, scoria or pumice; 3) stack tube sandbags filled with insulating material on the outside of the wall. - Engineered soil mix such as road base from sand and gravel suppliers avoids risk of problem soils and saves hundreds of hours of hand labor. - Stabilized earth (adding lime or cement to the bag fill material) is usually unnecessary except for domes in moderate to high rainy climates, and then lime is preferred over cement. - Distribute piles of fill material (soil, gravel, etc.) evenly around the site to reduce labor and speed construction. - Insulated walls will cut energy costs in harsh climates: 1) fill bags with insulating material; 2) stack tube sandbags filled with insulating material on the outside of the wall. - A center pole or column built with stone, adobe or CEBs to support radiating roof poles or rafters is fairly simple to build, strong and very inexpensive. - Reciprocal roofs use self-supporting roof poles arranged in a spiral. These are extremely practical, although they take a bit of additional research and care to build. - Another option is to run steel cable through radiating rafters and secure with turnbuckles. Annealed nylon in the holes allows the cable to slide and adjust into position. This method and reciprocal roofs eliminate need for center supports and create an open floor plan. - Metal roofs are ideal for collecting roofwater. Plan carefully so as to reduce waste. The best may be to use metal roofs on a hexagonal or octagonal shaped roof. - Green roofs (living roofs) are another interesting option that can beautify your home, as well as add insulation, habitat for wildlife and reduce noise. - Superinsulate the roof to achieve maximum energy efficiency. - Use salvaged/recycled materials as much as possible to cut costs and reduce environmental impact. Recycled or misprinted bags, for instance, are readily available and can substantially reduce cost of construction. In addition, barrels, tires, scrap wood from pallets, culvert pipe and wagon wheels can be used for arched door and window forms. - What size of bags to use depends on the design and the sizes available. The most common size used for earthbag building is approximately 18"x30" when measured empty. Also, 22"x36" bags are useful for special applications such as wide stem walls and basement walls. Tubes are popular among some builders. - Team size: work in teams of 2-3, each doing one task; rotate to stay fresh. - For constructing earthbag domes, use twine or rope guides versus elaborate metal guides.